Hello! 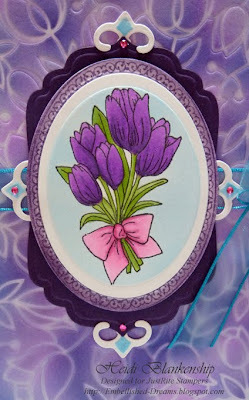 Today I have--yes you guessed it another flower card--LOL! But today's card is a really quick and simple one. 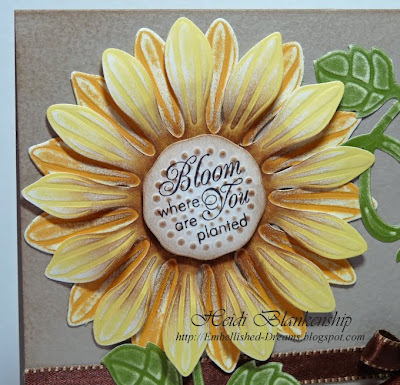 I wanted to use one of the sentiments from the newly release stamp set Seeds of Kindness from JustRite Stampers and I thought it might look kind of neat in the center of a flower. 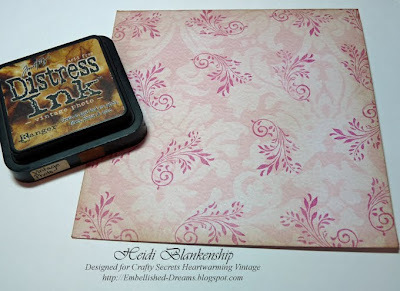 The Seeds of Kindness stamp sets includes 6 Designer Centers and 6 Interchangeable Borders and fits with the 1-5/8'' Round Stamper. 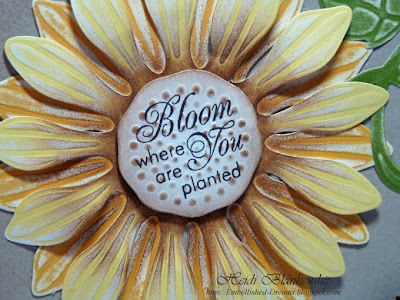 I started by stamping the sentiment with brown ink onto white cardstock and then I used the flower center from Sunflower Set One S4-157 die template to cut/emboss the flower center. Before removing the cardstock from the die template I used the die as a stencil inking through the holes. Then I also inked around the edges. 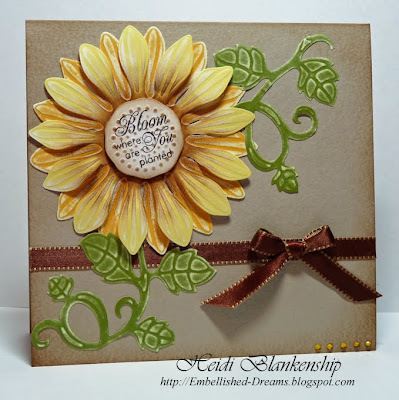 Next I cut/embossed two of the sunflowers using the Wizard™ and Sunflower Set One S4-157 die template from Spellbinders™. For the sunflowers I used two colors of Post-it Craft Paper, Sunshine and Golden. The Post-it Craft Paper has a white core so I lightly sanded the diecuts to reveal the white core. I layered the two diecuts and then I inked the inside of the flower with brown ink. I added foam mounting tape to the backside of some of the petals to add some dimension. 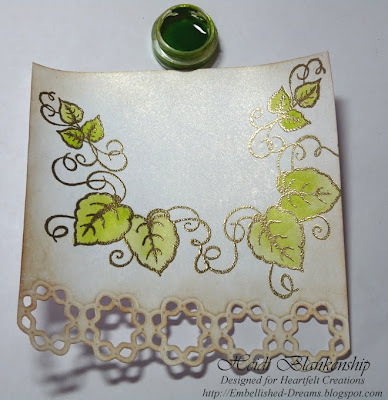 For the leaves I used Jungle Post-it Craft Paper and On The Vine Grand Border S7-017 die template with the Wizard™ to cut/emboss the vine. I cut a couple of pieces off of the vine and lightly sanded the cardstock. The card base is a light tan colored cardstock and I inked the edges with a brown ink. I also added brown ribbon and some tiny rhinestones. To add the ribbon I used Fabri-Tac and for the rhinestones I used Gem-Tac, both products are from Beacon Adhesives. 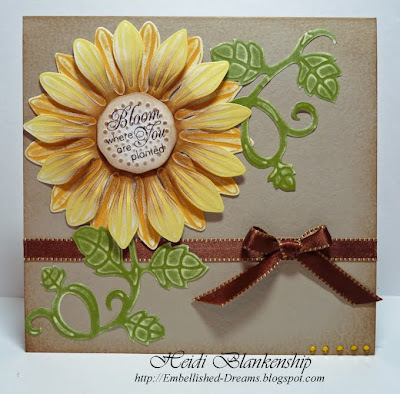 I hope you enjoyed the quick sunflower card and thank you so much for stopping by today! I also want to remind you to check out the JustRite Friday Challenges. You can click HERE to find out all of the details. I can't believe it's already Friday!! Where did the week go? I hope you all have a wonderful weekend!! How about another Springtime card? *wink* The sun is shinning today and things are starting to melt but still not fast enough--LOL! I think everyone is starting to get Spring fever. 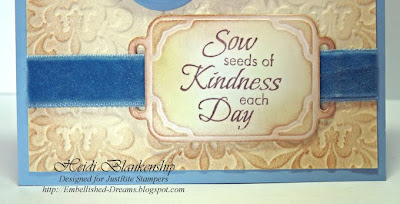 For today's card I used some of the newly release stamp sets from JustRite Stampers, Beautiful Blossoms, Seeds of Kindness. 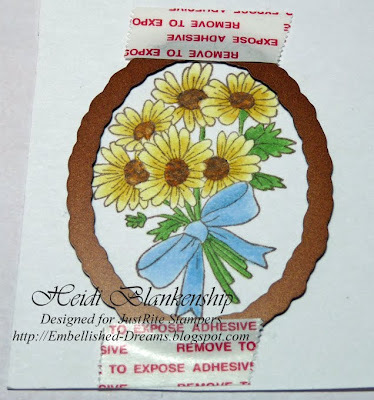 The Border and the Daisy image are from the Beautiful Blossoms set. 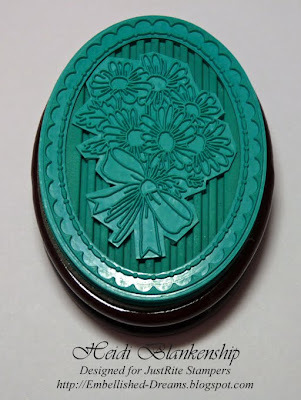 This set includes 4 Designer Centers and 4 Interchangeable Borders and fits the 2-1/4'' x 3-1/16'' Oval Stamper. 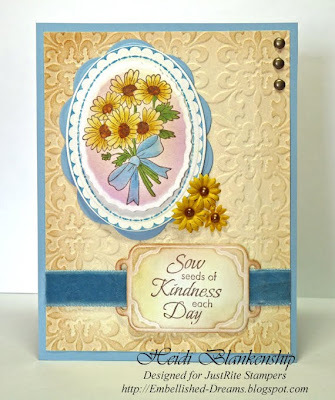 The Sentiment is from the Seeds of Kindness stamp set which includes 6 Centers with Sentiments and 6 Interchangeable Borders and fits the 1-5/8'' Circle Stamper. 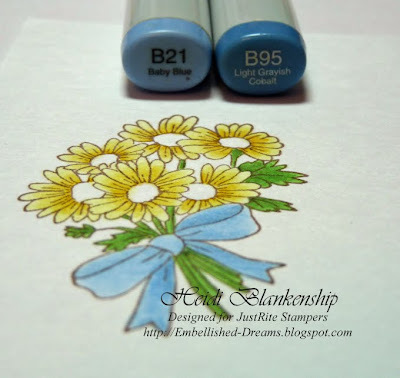 Here is a close-up of the bouquet of daisies image and the border from the Beautiful Blossoms stamp set. I started by stamping the image with black ink onto white cardstock and colored the image with Copic markers as shown in the pictures. 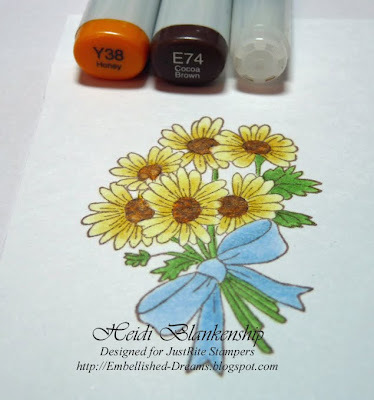 For the petals I used three shades of yellow Copic markers. Next I colored the leaves and stems using two colors of Copic markers. For the bow I used two colors of blue Copic markers. I thought the soft blue would look pretty with the yellow. 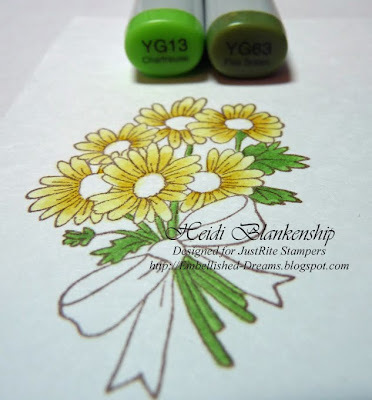 I colored the center of the daisies with Honey Y38. 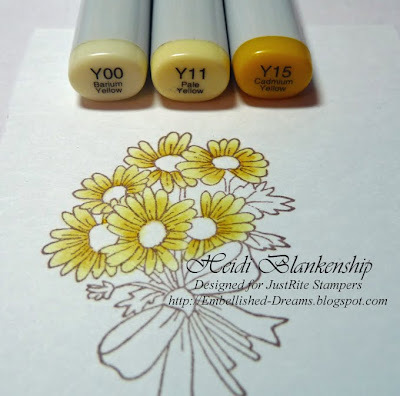 Then I made little dots with Cocoa Brown E74, then I went over the entire area again with Honey Y38 and then I dabbed the colorless blender pen over each of the centers. I lined up the Deckled Edge Classic Oval Large S4-259 die template from Spellbinders™ and using the Wizard™ I cut/embossed the oval. After I made the diecut I left the paper in place and used the die template as a stencil to airbrush through with the Copic markers. Here is a close up of the flowers. 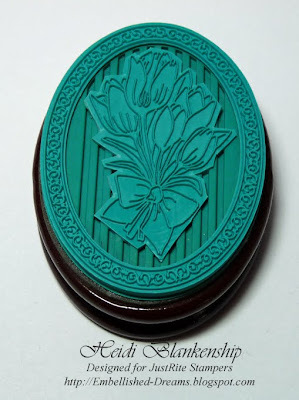 I stamped the border using a blue ink and cut/embossed the oval using the Wizard™ and Classic Ovals Large S4-110 die template from Spellbinders™. I also used the Big Scalloped Oval Large S4-251 die templates to make a oval diecut with large scallops for the mat. 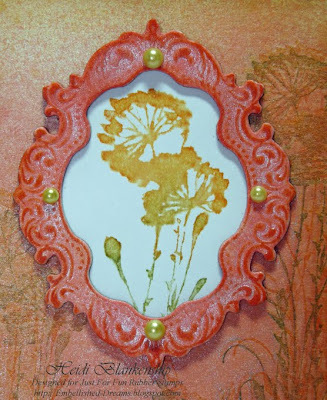 I added foam mounting tape to each layer giving it some added dimension and then I added three little paper flowers with pearls centers for an embellishment. 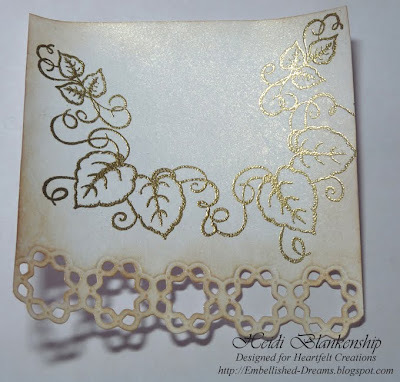 I stamped the sentiment onto a piece of white cardstock with brown ink and made the tag diecut using Ribbon Tag Trio Two S4-234 die template from Spellbinders™. Leaving the paper in the die template I airbrushed using Copic marker Y00, then I removed the paper and inked the edges with brown ink and attached the tag to the card with a blue velvet ribbon. 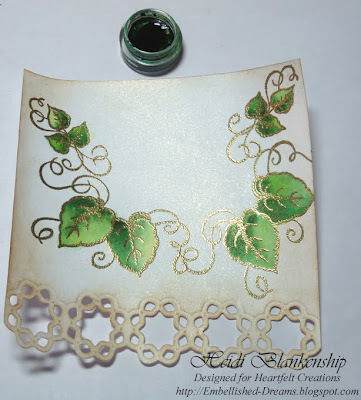 For the background I embossed a piece of ivory cardstock using Fleur De Lis Pattern I2-1014 Impressabilities™, misted the entire piece with Iridescent Gold Glimmer Mist and then inked the edges with brown ink. 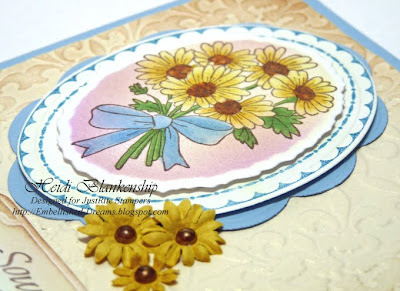 Thank you for stopping by today and I hope the daisy card will add a little Springtime to your day. Hello! 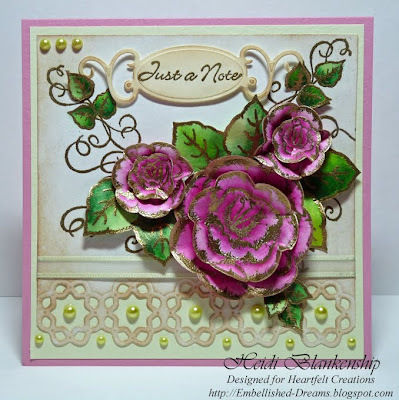 I am very excited to share my first Heartfelt Creations card with you today! 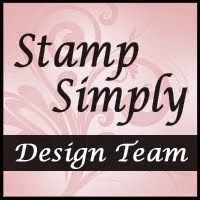 I just started working with the stamp images and I have to say I love them!! All of the stamps from Heartfelt Creations are deeply etched red rubber and have a wonderful design quality with nice crisp images. But wait until you see the New Release!! 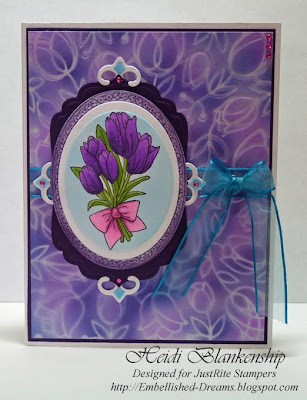 Some of the New Releases from Heartfelt Creations match some of the Spellbinders™ Nestabilities™! How Fantastic is that!! Click HERE to see all the New Releases. 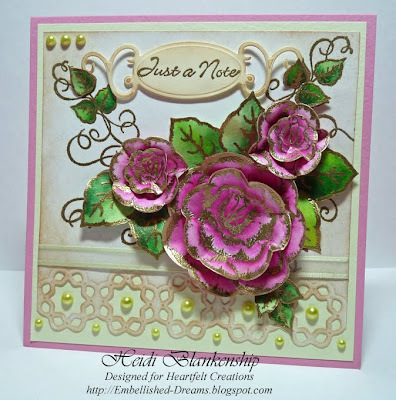 Here is the card I created.~~~ I absolutely LOVE how the roses turned out!! 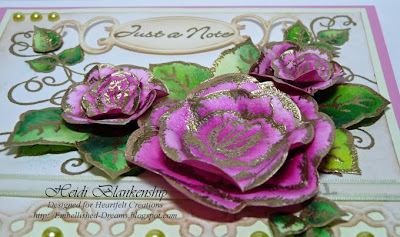 To create the Roses I used two stamp sets from Heartfelt Creations, HC 226A (set of 4 roses), HC 226B (set of 3 roses). 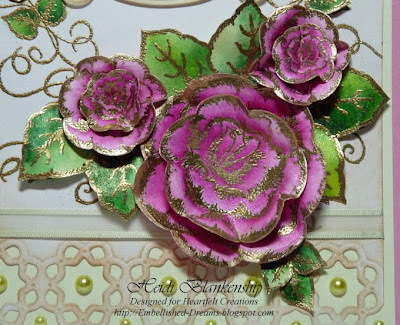 Both Rose stamp sets match the Blossom S4-192 die template from Spellbinders™. For the Leaves I used the HC 225D-PC(set of 3 leaves) stamp set and for the Sentiment I used Mini Message Cursive Set 1189S. 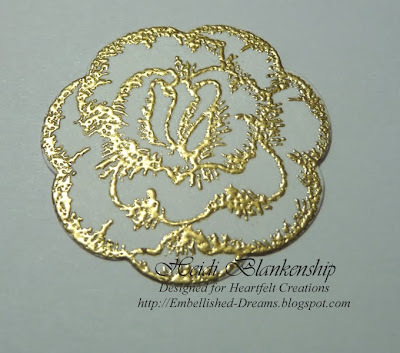 To start I stamped several of the rose images (three different sizes) several times with gold pigment ink and then heat embossed with gold embossing powder. After the embossing powder cooled for a few seconds then I cut the rose image using the Wizard™ and Blossom S4-192 die templates from Spellbinders™. 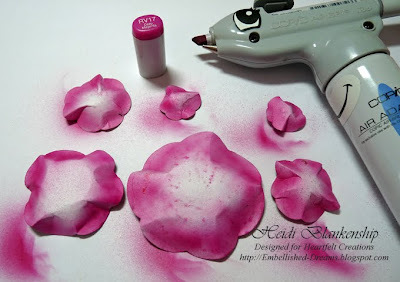 I used Blushing Rose Twinkling H2O's to watercolor the roses. I had 2-3 layers of the Twinkling H2O's on each flower, starting very light and getting darker to add shading. Next I worked on the leaves. 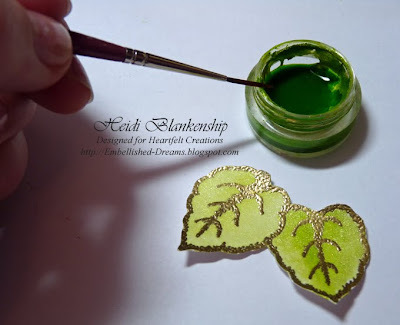 I stamped several leaves with gold pigment ink and then heat embossed with gold embossing powder. I used two colors of Twinkling H2O's for the leaves. I used Lemon Grass for the first layer. For the second layer of Twinkling H2O's I used Green Tea. While the roses were still a little damp I shaped them and then I airbrushed the backside of each of the roses. I did the airbrushing so the roses would look pretty once they were layered and so if the petals were curled up you wouldn't see stark white from the bottom of the paper. I also airbrushed the backside of the leaves. For the roses I used Copic sketch marker RV17 and for the leaves YG25. Next I worked on the background paper. 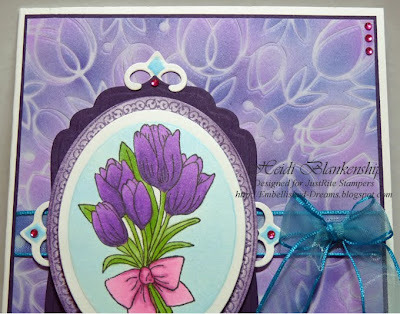 First I cut/embossed the bottom border using the Lotus Borderabilities® Petites S4-240 die template from Spellbinders™. Then I inked the edges with Distress Ink Vintage Photo from Ranger. I wanted to add a little more sparkle to the paper so I sprayed Iridescent Gold Glimmer Mist over the entire piece. 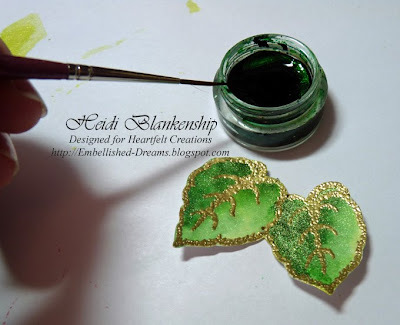 I stamped some of the leaf images with gold pigment ink and then heat embossed with gold embossing powder. I used the same Twinkling H2O's as mentioned above to watercolor the leaves. Lemon Grass for the first layer. And Green Tea for the second layer. Here is a close-up of all the roses and the leaves. The next step was to assemble all the pieces. To adhere the roses and the leaves I used hot glue. 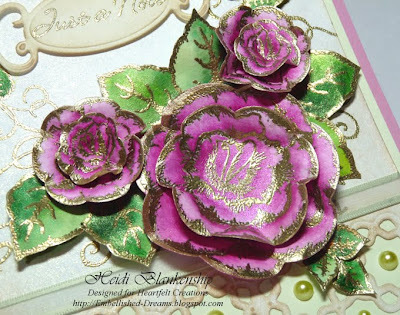 Here is a close-up of the roses and the leaves on the card. I think the roses are so Beautiful! I took a couple pictures of the roses from a different angle so you can see all the dimension. A sentiment was added to the top of the card. The sentiment is from Mini Message Cursive Set 1189S. 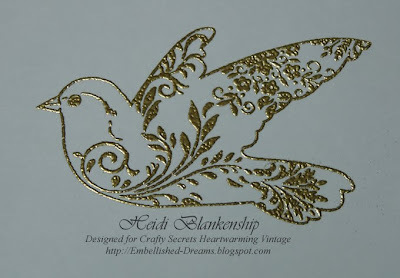 I stamped the sentiment in gold pigment ink and heat embossed with gold embossing powder onto a tag. To cut/emboss the tag I used Fancy Tags S4-235 die template from Spellbinders™ and then I inked the edges with Distress Ink Vintage Photo from Ranger. I also added some pearls to the top corner. Along the bottom I added some light green sheer ribbon and pearls for a finishing touch. Please be sure to check out the Heartfelt Creations Website, Blog and Gallery! You are sure to be inspired!! 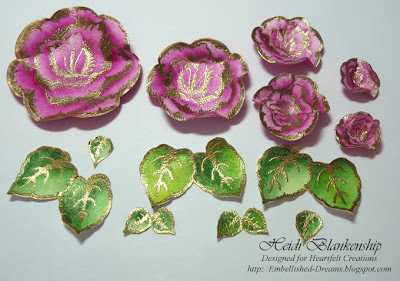 I have also added links to the Heartfelt Creations Design Team Members to the sidebar on my blog. Thank you o much for stopping by today! I hope you enjoyed the tutorial and I hope you have a Wonderful Day!! Good morning! 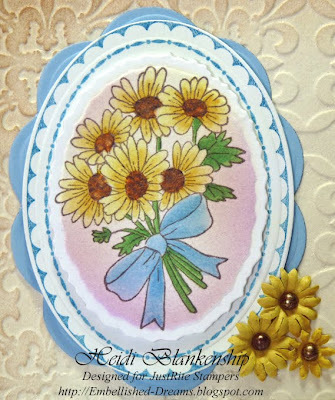 Today I have a pretty Spring floral card to share with you. I think everyone is feeling a little cabin fever and is ready for Spring! 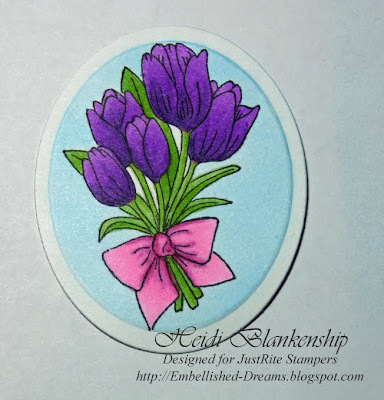 The tulip image is from the New Breath of Spring stamp set from JustRite. 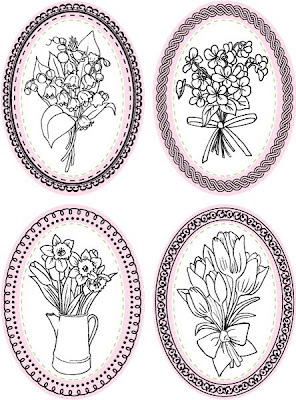 The Breath of Spring stamp set includes these 4 beautiful floral Designer Center images, Lily of the Valley, Violets, Daffodils and Tulips and 4 Interchangeable Borders. 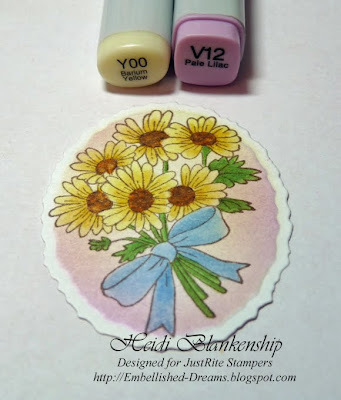 The Breath of Spring stamp set fits the 2-1/4'' x 3-1/16'' Oval Stamper. Here is a close up of the stamp image and border that I used. 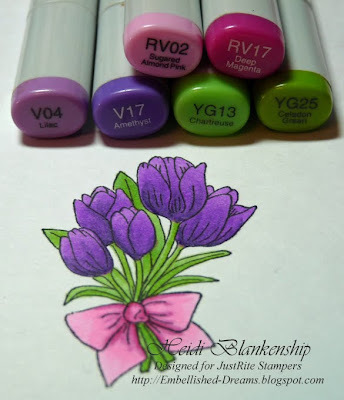 I stamped the center image of the tulips onto white cardstock with Memento Tuxedo Black ink from Tsukineko and then I colored the image with Copic markers. After the image was colored then I used the Classic Ovals Small S4-112 die template from Spellbinders™ and the Wizard™ to cut/emboss the oval. I wanted to airbrush around the outside of the image so I created a mask. To create a mask stamp the image onto some printer paper, cut the image out and apply some 2-way glue to the back of the image and wait for the glue to dry. The glue will still be tacky enough to hold the image in place. Then airbrush. Here is the image after airbrushing. 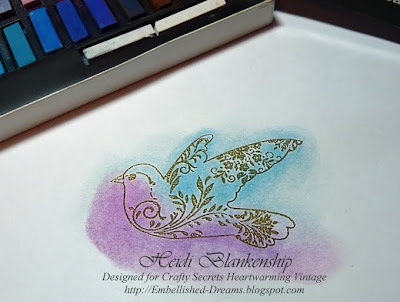 I stamped the border with Dusty Concord ink from Ranger, cut/embossed the oval using Classic Oval Large S4-110 die templates from Spellbinder™ and inked the edges. For the decorative mat behind the images I cut/embossed Labels Four S4-190 and Fancy Tags S4-235 die templates from Spellbinders™. I also airbrushed a little on the tags. For the background I started with a white piece of cardstock and I embossed it using the Tulips Impressabilities™ I2-1008. I left the Impressability in place and then airbrushed with Copic markers. For a finishing touch I added some tiny pink rhinestones using Gem-Tac from Beacon Adhesives and some sheer aqua ribbon using Fabri-Tac from Beacon Adhesive. Here is a close up of the stamped image. Thank you so much for stopping by today! I hope you have a Wonderful Monday!! Good morning! I can't believe how fast this week went by, but not fast enough for Spring to get here! It was snowing AGAIN when I woke up this morning, great big, huge flakes. We have so much snow right now it might be July before we see the grass. *wink* For today's card I used stamped images from Just For Fun Rubber Stamps, Brushed Wildflowers G2698 and Just a Note WB8010. I started with a piece of white cardstock and sprayed Candlelight and Coral Reef Glimmer Mist over the entire piece. 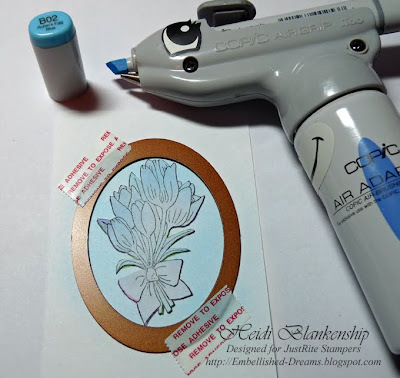 Once the Glimmer Mist was dry I stamped the Brushed Wildflower image first using Spiced Marmalade and then with Peeled Paint distress inks from Ranger. Next I sprayed Coral Reef Glimmer Mist over the entire frame and once the Glimmer Mist was dry then I took the Spiced Marmalade ink pad and rubbed over the entire frame. The ink picked up on the embossed areas of the frame and gave it the pop it needed. 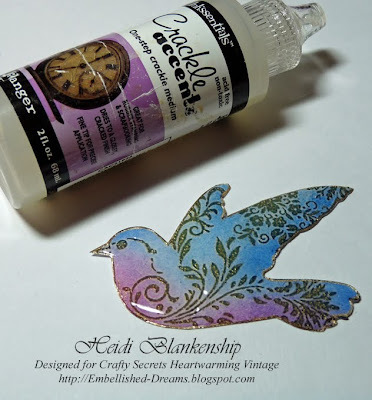 Using the Spiced Marmalade and Peeled Paint Distress Inks I inked the stamp and then misted it with water, then stamped the image. Misting it with water allows the colors to blend. 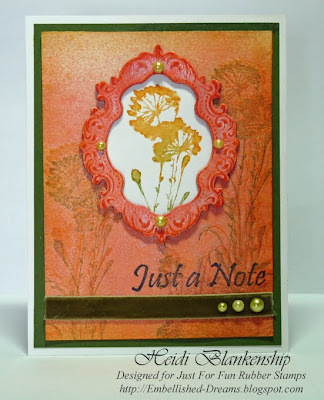 I cut out the stamped image and added the frame and layered it onto the background piece. On the bottom of the card I stamped the sentiment and then added some velvet ribbon using Fabri-Tac from Beacon Adhesives and pearls. I also added some pearls to the frame. I layered the background piece with olive green and white for the card base. Thank you so much for stopping by today! Don't forget to hop on over to Just For Fun Rubber Stamps and check out all of the images they have available. I hope you have a wonderful weekend!! The Great Crafter's Tool Hunt 2 --Go & Vote!! When Creativity Knocks' is on the look out for the Great Crafter's Tool Hunt 2™!! Spellbinders™ Presto Punch™ is in the running for Whose Tool Will Rule? so please click HERE to visit When Creativity Knocks' and vote for the Spellbinders™ Presto Punch™ System! One lucky entrant could win all the tools in the contest!! Click HERE to see a video. Heartfelt Creations Design Team Announcement! I am very excited and proud to share the announcement with you that I have been asked to join the Heartfelt Creations Design Team! 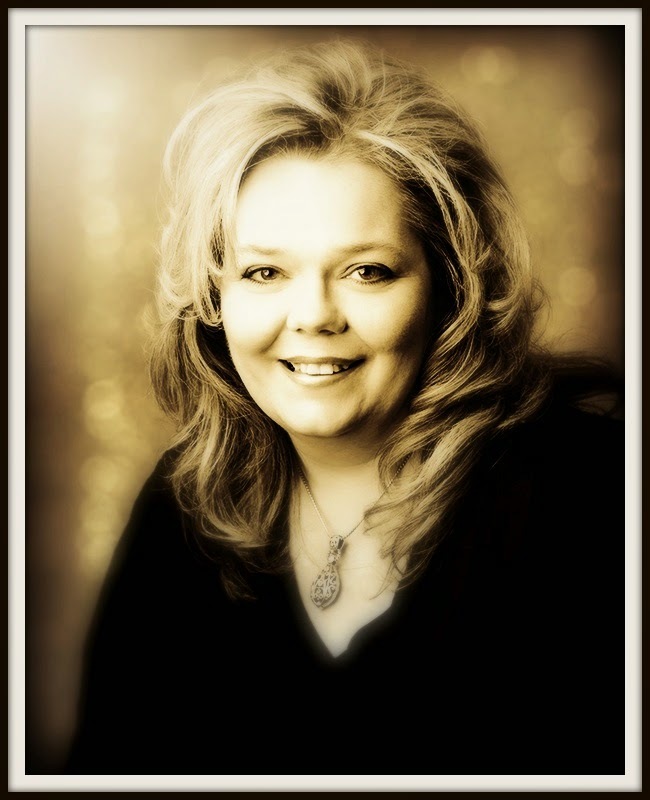 Heartfelt Creations is a family owned business with a wonderful story of how they came to be. 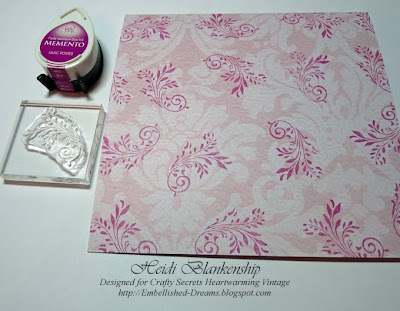 Heartfelt Creations has many beautiful rubber stamp images and their newest releases are stamp images that match the Spellbinders™ die templates. Click HERE to see the new designs. 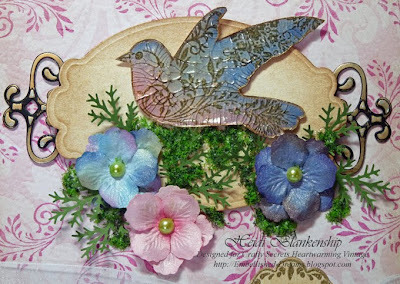 Today on the Heartfelt Creations Blog they introduced seven new designers that will be joining the Design Team, Inger Marie Lea, Maya Stenshagen , Aina Myren, Karen Taylor, Kathleen Page, Heidi Blankenship, Linda Duke. I am also very excited because two of the ladies on the new design team are very dear and sweet friends of mine Linda Duke and Karen Taylor---so Congrats to both of you and I look forward to being able to continue working with you!! A Big Congrats to all of the ladies who made the design team--I am looking forward to working with all of you and I can't wait to see all of the beautiful designs you will create! Thank you so much to all of the wonderful people at Heartfelt Creations for this wonderful opportunity!! Be sure to check back and I will have some creative inspiration using Heartfelt Creations products to share with you all very soon. 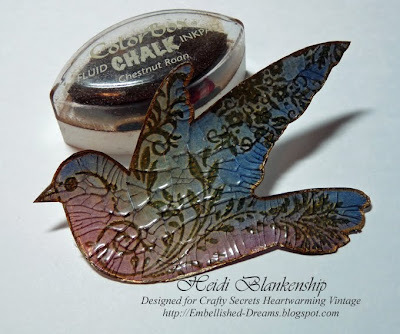 Good morning and Welcome to another Crafty Secrets Challenge! Today our challenge was to use color on our images and to share with you how we did our coloring. I have a link list at the bottom of this post so you can visit each of the Crafty Secrets Designers. For my card I used the NEW Cupcake Party stamp set from Crafty Secrets. I think this is going to be one of my new favorite stamp sets! Here is the card I created. 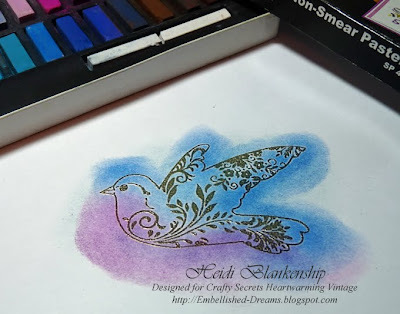 I used the bird, flourishes and the hello sentiment from the Cupcake Party stamp set. 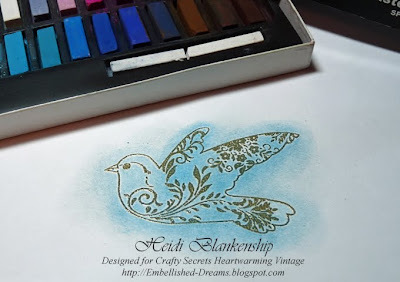 As part of my tutorial I will share with you how I created the beautiful crackle vintage bird. 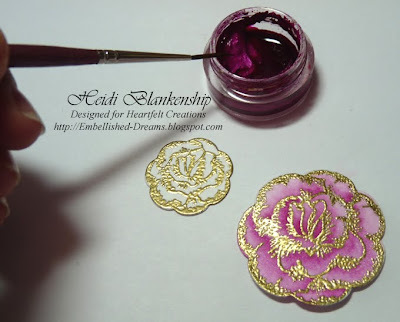 Step 1~Stamp the image with gold ink and emboss in gold. Step 2~ To add color to the bird image I used pastels and applied the color just using my finger. Easy peasy! I started with a light blue. Step 3~ Next I added pink. Step 4~ Add a dark blue. 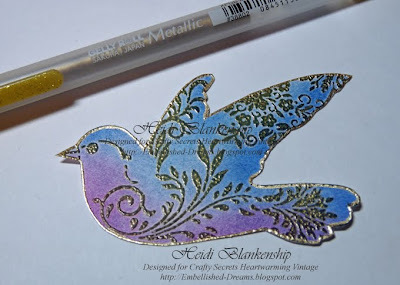 Step 5~ Cut out the image and edge it with a Gelly Roll Metallics Gold pen from Sakura. Step 6~ Add Crackle Accents from Ranger over the entire image and set aside to dry. Here is what the Crackle Accents looks like after it is dry. Step 7~ Apply Chestnut Roan ink directly to the image and wipe off excess with a kleenex. By applying the ink directly to the image it will fill in the little cracks to show off the crackle. 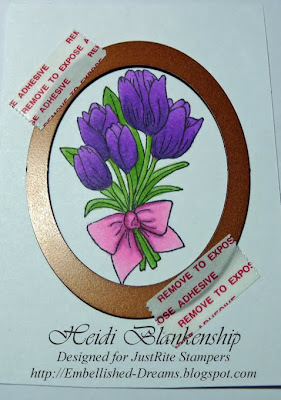 Step 8~ To create the oval die cut I used the Wizard™ and Labels Ten S5-022 die templates from Spellbinder™. 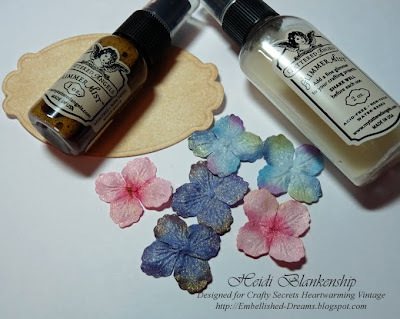 I misted the label with Crushed Shells Glimmer Mist and for the flowers I used Iridescent Gold Glimmer Mist from Tattered Angels. Step 9~ For the base of the card I used a piece of cardstock from the Classic Paper Pad from Crafty Secrets and I stamped the flourish image on top. Step 10~ The last step I used for adding color was to ink the edges of the card base with vintage photo ink. Here is a close-up of the bird with the flowers. For the background I used the Labels Ten S5-022 die cut and the Fancy Tags S4-235 were added behind the oval. I used a twig punch and added some Flower Soft and I also added pearls to the center of the flowers. The tag was stamped and embossed in gold. I added foam tape to the back and light blue sheer ribbon to attach it to the card and some pearls to the corners. Here is another look at the finished card. Don't forget to stop by each of the Crafty Secrets Designers and see what they created for the color challenge! I know I can't wait to see!! 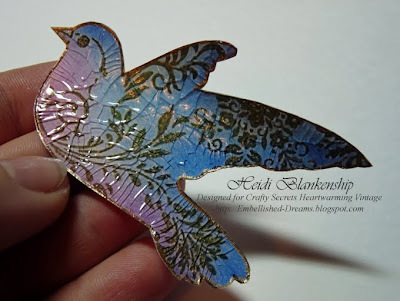 Spellbinders Special Blog Team Announcment!! !